Coffee Trail - Counting Stars, Reaching Delphi .✫*ﾟ･ﾟ｡.★.*｡･ﾟ✫*. : Yin & Yang Amongst the Letters of Krishna, Godavari, Dolphins and Santas. Yin & Yang Amongst the Letters of Krishna, Godavari, Dolphins and Santas. I left a sunny Tiruchi and bid farewell to the sights of the yet to be fully fed Kaveri for my next stop — Nashik, an ancient holy city in the north-west of Maharashtra state. 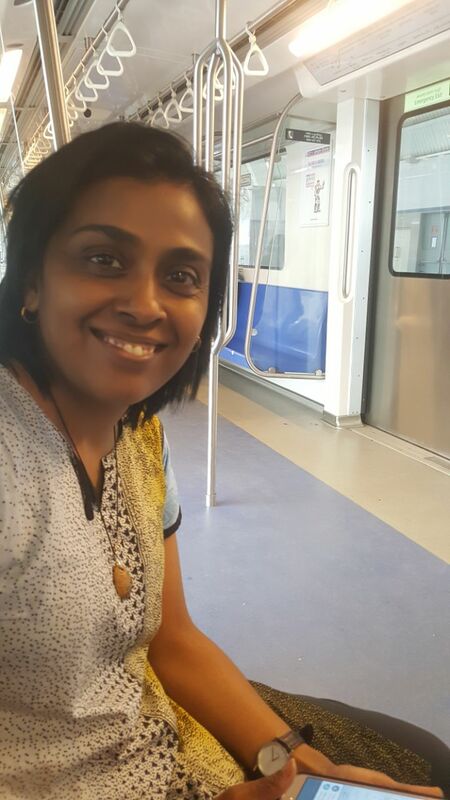 But before that, I made a short stopover in Chennai to meet up with my cousins whom I hadn't seen in a while. 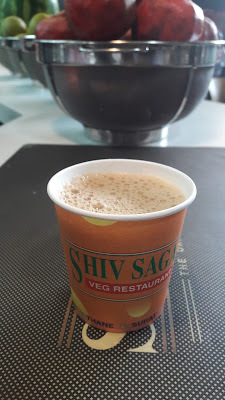 Here is one place that no matter how good the homemade coffee is, I still insist on that one which is sold at the tea stall a few streets away. Disappointingly though my plans were rained out this time. The skies didn’t clear up to the repeated recital of ‘rain rain go away, Uma wants her stall coffee today’, and though walking in the rain is always a pleasure, none of us was up to the chilly winds. 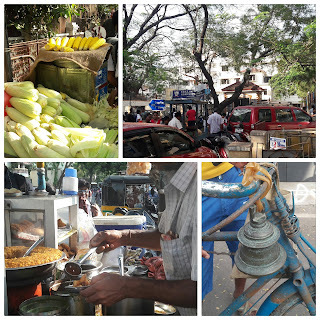 This also meant our traditional visit to Marina Beach and eating capsicum bajhis there would be unticked. Fortunately, though, I do have a couple of sun-filled pictures from a previous trip to the same location at Anna Nagar (a suburb in Chennai). Just looking at these beats the cold outside. The first set is at a local tea stall, frequented mainly by locals. 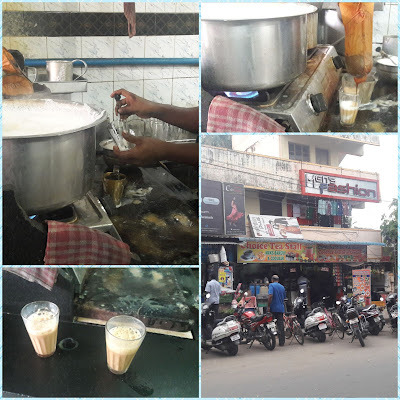 The preparation is fresh, milk is kept heated at the right temperature, and the coffee/tea is served to your preference, for me it was like he could read my signals. Divine! It’s priced reasonably, prepared quickly and served instantly for the customers (that explains the mess right, 😀). The environment is not a café-like setting so if you are looking for an uppity experience, this isn't the one for you, but I can certify that the coffee is worth the rupees. It is the capital of Tamil Nadu. This is the 5th largest city in India and is regarded as the safest one in the country. Good to know that I am not the only one who enjoys the food in this region, so do millions more. National Geographic rates Chennai's food as the 2nd best in the world. Coffee on me, if you tell me who leads this race. It’s located on the coast of the Bay of Bengal (the sea along Marina Beach). Marina Beach stretches up to 600km!! It is the 2nd longest beach in the world. Was officially known as Chennai from 1996, but before that was referred to as Madras, the name used even before the British days. SIPCOT IT Park is the largest IT Park in Asia. Chennai region has the oldest rocks in India, dating back billions of years. Mahabalipuram! Cricket fans, did you know that Chepauk M.A. Chidambaram stadium is the oldest cricket stadium in India? Many well-known universities are located here — these include Anna University, Indian Institute of Technology (IIT), MGR Research Institute and M.G.R Medical University. Narayan previously took me on a tour down memory lane to show me his dorm, room and where his classes once were in IIT Madras. Most students were on vacation, but I still managed to get a glimpse of the students' rooms, for once my wardrobe looked more organised in comparison. After indulging in Sundar’s (he stays with my cousins) sweet and savoury kulhi-panirayam and undergoing an acupuncture treatment session (performed by my cousin’s wife) to ease this month-long cough I was all set to continue my next leg of the adventure. One mystery remained unresolved — the misbehaviour of Airtel — I was out of touch with the data world despite having a fully paid local subscription. 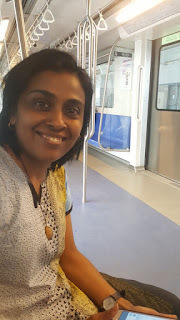 Before that, look, here I am in the new MRT which connects Chennai airport and the various suburbs. But quick, quick, get me to the airport first. My cousin made sure that I had indeed checked in with a few minutes to spare. I hurried past security and was just in time for the boarding, then opened my eyes and next thing I knew I was already at thirty thousand feet but the views of the rivers snaking along and the Western Ghats or Sahyadri mountain range (which is approximately 3000 metres above sea level) appeared like I was much closer to them. The person in the seat next to mine told me ‘that's Krishna’ and it was love at first sight with the nadi. I am still mesmerised by the breathtaking views of these million-year-old rocky cliffs. Krishna, one of the few rivers which glides in-between these grand formations is 1300 kilometres long, the 4th longest river in the country, and is the source of irrigation for four South Indian states — Maharashtra, Karnataka, Telangana and Andhra Pradesh. There are four rivers (Venna Urmodi, Tarli and Koyna) which join the Krishna at a confluence known as Preeti Sangam, or ‘Lover's Meeting Point’. Just as in Dashavatara, I wish I could transform myself into a fish to understand what goes on beneath that scary stillness. It’s going to take me a lifelong journey to learn — but I reckon a River Guide For Dummies, would be a good start. I did not have my camera/handphone with me, and even if I did, it would not have captured the beauty of the present better than the heart. These Ghats house wildlife sanctuaries, national parks, forest reserves, dams, and is regarded as a UNESCO world heritage site. As we flew towards Mumbai, my next destination, I saw more rivers. The Godavari. Godavari is the second longest river in India (1485 kilometres), flowing from west to east, covering eight states (Maharashtra, Telangana, Andhra Pradesh, Chhattisgarh, Madhya Pradesh, Odisha, Karnataka and Puducherry) and all the way right up until meeting once again, my good pal, the Bay of Bengal. 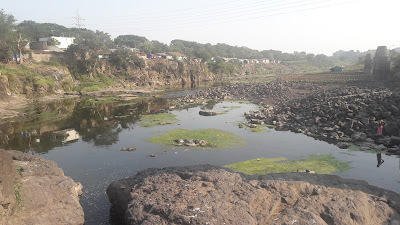 The Godavari starts in Triambakeshwar (Nashik), and Nashik is where I'd be spending the next few days with Vrushali, my lovely host and the beautiful bride, as well as her family and friends. Before heading to Nashik, which would take anywhere between 3.5 – 5 hours by road (depending on traffic), I got myself energised with a hot cup of coffee and samosa at the airport. Well, it wasn’t exactly right for my tastes, but it was something to fill up on. I must admit the bright orange cup they served their drinks in had tempted me. 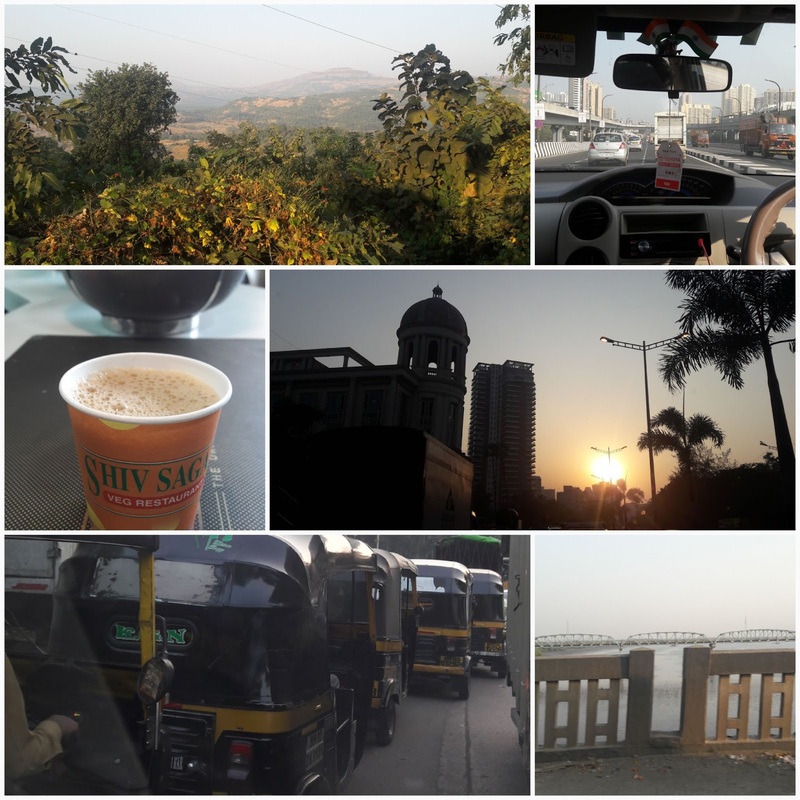 Nevertheless, understanding it was still a good decision, I would say, because it kept me awake to enjoy the exciting sights in the different townships and views of the stunning Ghats and valleys throughout the drive. Prepaid cab services are reliable and very professional, these can be booked online ahead of time. My driver spoke very little English, but we got by with the few but essential words of Hindi I knew and some sign language. He understood my requests to slow down or stop for photos. Narayan, Vrushali, Pranav and Gaurav handled the rest of the E1 translation over the phone remotely. The coffee and the Yin and Yang from the previous day's acupuncture session are both working together effectively towards keeping me sensibly balanced! And thank you Airtel for the unlimited local calls and for finally working, or shall I say for deciding not to ditch me (for the record, Airtel is not paying me for mentioning them 😉). Nashik is an ancient holy city in the northern part of Maharashtra state and is 2300 feet above sea level (which means temperature-wise, it’s comfortably cooler here) and has a projected 15 million population. It is about 170 kilometres from Mumbai Airport. There are a couple of interesting facts on how the name Nashik was derived for you to read up on. 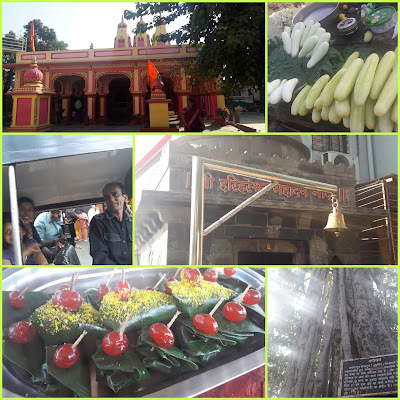 My intent to visit Nashik was solely for the wedding, but Vrushali insisted I should also see a bit of her town. And so that’s what I did, with her lovely friends from Kerala and their families. Seven of us comfortably snuggled in an Auto (local three-wheeled taxies), as we spent a warm and sunny afternoon in mystical Nashik, covering over 10 temple sites, and having a crash course on Ramayana and the history of Nashik in the local language. My head is overworked, I had taken in more information than I could handle for a day. On a lighter note, we did have some delicious Indian food where our bread orders got exchanged and then some cherry-topped Paan to finish off the meal with. And the finale, the icing — was being face to face with the great Godavari herself. There she was, right in front of us — here is where she begins her journey, our guide tells us. Just look — she is that great one who supports the millions along her 1465 kilometre journey across the eight states as she makes way to unite with the sea. Life is a journey just like this river, and anything is possible along the way. I am dazed, and I still cannot wake up. I mentioned a crash course earlier. Well, I am awake now, but I am still lost in translation. And speaking of which, I have just registered for a new language course. Pretty excited, guess which language? 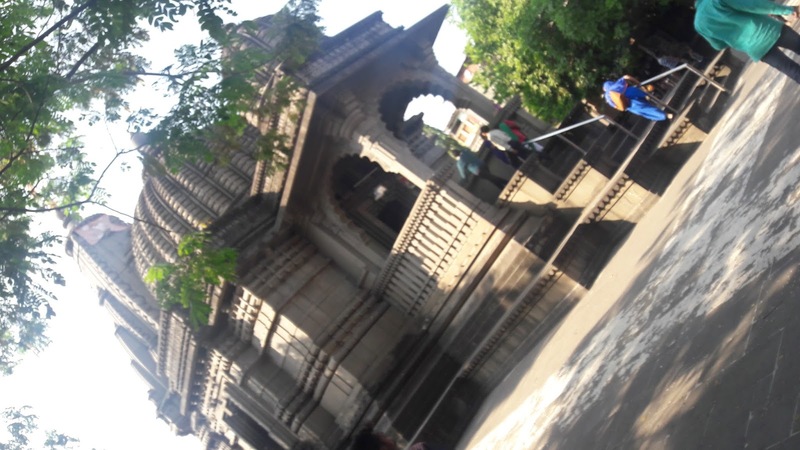 During this quick tour around, we visited a couple of notable places, one of them was the Kalaram Temple — a Hindu Shrine built in 1788, dedicated to Lord Rama. We also visited a few other temples, but I didn't get a chance to record their names. Nashik is also an important business hub. It houses many large-scale industries and is an emerging destination for various new technology start-ups and R&D centres. The currency note press is located here. In terms of agriculture & plantation, this region produces most of the Indian wine. Local vineyards offer wine tasting tours. During the drive along the outskirts of Nashik, I noticed many miles of other plantations. The cold climate and good irrigation system contribute to its export quality products such as onion, corn, sugar and wheat. Just look here, what a perfect sunrise in the fields. 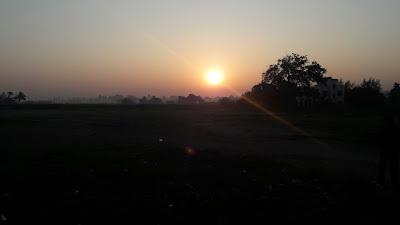 This picture was taken early in the morning on my way to Shirdi. The sights in Nashik and Mumbai are very picturesque. I had as in my previous blog posts mentioned that in any given place, it’s the people who make the difference for me. Just as all whom I know in Tiruchi or Chennai are, the local Nashik-ans are warm and friendly and do whatever they can to make their city and my stay a comfortable one as much as possible (and we do the same too 😃). 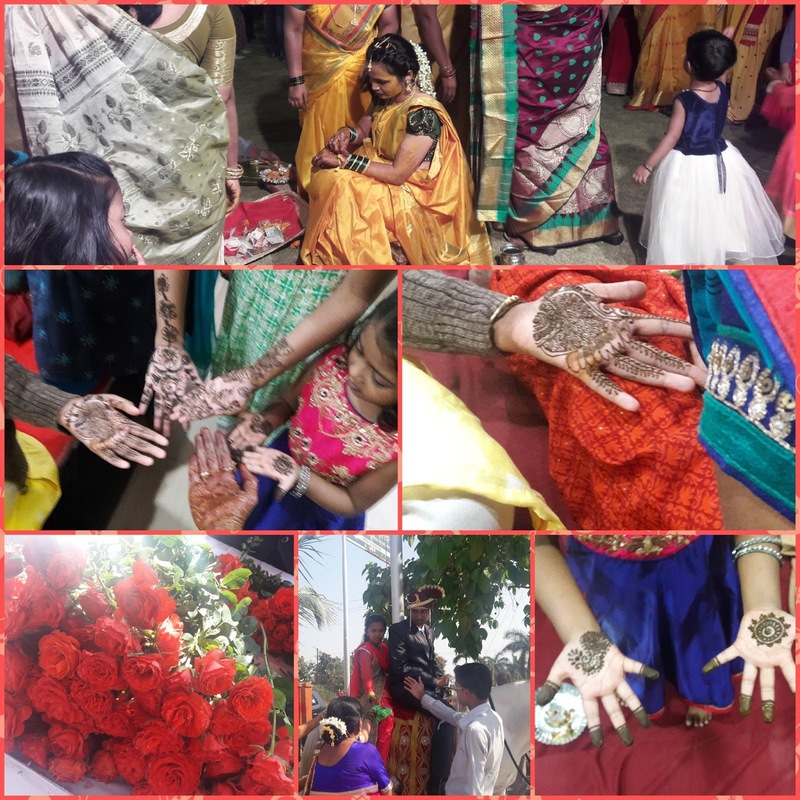 This was my first experience attending a traditional Marathi wedding. With the couple's permission, here are some of the pre-wedding function highlights and pictures to share with you. 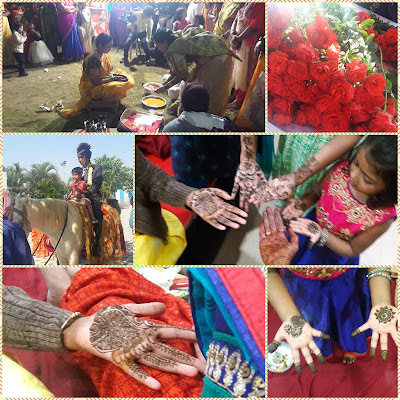 Mehandi (hand art painting) – a tradition to wish the bride and groom good health and prosperity as they make their journey into marriage. This is also a medicinal remedy to cool the body and relieve the bride/groom from stress. This tradition is performed in many Hindu weddings in the different regions in India. In the past, it was more of a family affair. These days, the excitement is extended to the families and friends, and that explains how I got my hands painted too. Sangeet – music is everywhere in India and weddings are no exception. Sangeet celebrates dance and songs, everyone participates, so don't be shy. Everyone has a move or two to spin too. The colours, music and beats are loud, it’s party time. Haldi – this is a religious ritual where elders apply turmeric paste on the bride and groom as a symbol of blessing and to ward off the evil eye from resting upon the couple. My flight back was delayed by many hours, but interestingly while charging my handphones in the common area in the airport, I met Niraj, a local sailor who was returning home after being away at sea for 6 months. Despite missing his connecting flight home, his spirits warmed up the cold airport as he talked about his daily adventures at sea, the star clusters that light up the dark nights and the endless sights of dolphins playfully racing with the seagulls. He later sent me pictures of the seals that sometimes visit them on the deck. I wonder if those stars and dolphins point the way to Delphi. ** General facts referenced from online Wiki. the mahout is pleased :-) .